During the last eight years, gold has had a record bull run, rising from $328 in 2002 to $1,375 an ounce today -- its longest climb in 90 years. Of course, gold has some intrinsic value, but it generates no cash flow of its own. So what caused this steep price rise? The key hasn't been any inherent increase in gold's value to society. Instead, gold rose because a South African mine owner -- with help from consulting firm Bain & Co. -- invented a way to sell it to the masses without the hassle of physically delivering the shiny metal, explains a Bloomberg BusinessWeek article published Sunday. The question now is: How will the masses react when the parabolic price rise facilitated by this marketing coup ends up collapsing? The problem facing investors is simple. Gold underperforms stocks over the long run. According to Wharton professor Jeremy Siegel, gold has total annual real returns of just 0.6% since 1802 -- stocks, at 6.6% are much better investment performers, as are bonds at 3.6% and bills at 2.8%. But these statistics aren't scaring away gold investors because they don't reflect the marketing innovation spurred in 2002 by the World Gold Council -- an association of global gold producers. WGC Chairman Christopher Thompson, who then chaired Johannesburg-based Gold Fields Ltd., convinced James Burton, who had just retired as CEO of the California Public Employees' Retirement System (CalPERS), to lead an effort to get the New York Stock Exchange to allow them to sell gold-backed securities to the masses, according to Bloomberg. Burton accepted Thompson's offer, and with help from a Bain study -- dubbed Project Sun -- the SPDR Gold Trust (GLD) was born. After a two-year, $15 million marketing campaign, the ETF had its initial offerning on the New York Stock Exchange on Nov. 18, 2004, and was an instant success. Investing in gold became as easy as investing in a company. Since then, thanks to the constant repetition of the magic words "Fed money-printing" in advertisements and on talk shows, the price of gold has skyrocketed. 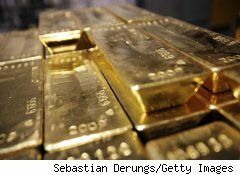 SPDR now holds 1,299 metric tons of gold worth $57 billion -- more gold than the Swiss central bank holds. Shares of the SPDR Gold Trust are now held by such diverse investors as hedge funds (Paulson & Co., BlackRock and Soros Fund Management), university endowments (University of Notre Dame) and the Texas teachers' pension fund. Even at $1,375 an ounce today, gold is cheap compared to the $2,226 an ounce inflation-adjusted price it traded at on Jan. 21, 1980. That's the day it plunged into a decades-long bear market, shortly before then-Fed Chairman Paul Volcker decided to break the back of inflationary expectations built up during the 1970s -- which began with Richard Nixon's 1971 decision to end the $35-an-ounce U.S. gold standard -- by raising short-term interest rates to near 20%. Gold bugs think today's gold market will be different from previous bubbles. But Bloomberg observes that gold's current rise "resembles moves reached before the three big crashes of the last decade: the Nasdaq tech-stock bubble of 2000, the U.S. housing market bubble of 2005-2006, and the crude oil-price spike of 2008." For George Soros and his peers, the key to profits will be knowing when the big players are about to shed their gold holdings and getting out before that day of reckoning. Small investors who put gold into their 401(k)s may not be so lucky.